When you have one specific question that you want to embed in, for example, an e-mail or specific webpage. In order for the embed question functionality to work you will need a radiobutton quesiton (an NPS question for example) and in order for the question to be compatible there needs to be images associated with the response alternatives. You will need images in order for all mail clients to be able to correctly display the question. The images could be a “Thumbs up/Thumbs down” or smileys for example. In an NPS question it is automatically added a colour scheme based on the NPS scale (from red to green). Click “Embedded question” to access the embedded question creation. In this menu you will have to begin with customizing what should be sent to the respondents. Near the top you will have a drop down menu called “Select question” for selecting what question in your survey you would like to use in you embed. If you do not have a question that is eligible, you will not be able to use embedded question. When a question have been selected, you will have a number of options to go through in order to customize your embedding. At the top you will have a button called “Edit” for changing the name of the specific sendout you are working on. This will be useful in case you are working with multiple sendouts from the same survey. Changing the name of them to something easily identifiable is recommended. It is not a must, but it will be a lot easier to navigate if there is a date or specific name that will help you identify what sendout it is. Background: Changes the background colour. Container: Changes the colour inside the main container. Container border-color: Changes the colour of the border around the main container. Answer border-color: Changes the colour of the border around the bar where the response alternatives are displayed. Answer background: Changes the colour of the bar where the response alternatives are displayed. Font color: Changes the font colour. Link color: Changes the colour of links. Show dashboard: Will give the respondents an overview of the collected answers once they have responded to the question. Show logo: Decides if there should be a logo in the embedded question e-mail sendout or not. Show footer text: Decides whether you want the footer text to be attached to the e-mail or not. NPS True colors: If you set this to “Yes” the NPS scale will be presented with alternatives 0-6 (detractors) as red, 7-8 (passives) as yellow and 9-10 (promoters) as green. Logo url: The URL to the logo that you wish to display connected to your question. Logo alt text: Should the recieving e-mail client block the logo from being displayed, the alt text will be displayed instead. Logo homepage url: If you click the logo in the e-mail, it will open a window to this page. Alternate Redirect: When a respondent completes and answers, they should be forwarded to this URL. Create everything in one survey and paste the respective link. Use logic to hide the embedded question. Note: The question must not be placed on page 1, since page 1 cannot be hidden. Footer text: This is the text that is displayed in the footer of the embedded question. Preview text in email-client: A short explanation that will be displayed inside the recipients e-mail client. Note: All URL:s need to include a correct transfer protocol (http or https). Attach the question in an e-mail sendout. You create an e-mail sendout with your embedded question by clicking “Continue”. Convert the embedded question into a Link survey. You do this by clicking “Convert to embedded link survey”-button. Subject: This will be the subject of the e-mail that is sent. The subject will be the first thing your respondents see when they receive the e-mail in their inbox, so be creative and try to capture the respondents interest with this short subject. Sender: You will need to specify what e-mail adress should be used for the e-mail. There will need to be an e-mail adress connected to the sendout, or the e-mail will not be sent. There are a couple of different formats for you to enter the sender adress, depending on how you want the sender to be presented for the respondents. This will add survey@netigate.se as the sender adress of the e-mail but the visible presentation of the sender will be “Netigate”. The adress that is within <> will be used as the sender, and you can select what adress to use. The sender will be survey@netigate.se and will be displayed as that when the respondents view the e-mail in their inbox. This method has no specific presentation added which means it will be displaying the e-mail adress directly. Below these two boxes you will have a larger text area where you need to enter your survey specific e-mail text. To make it easier to work with your mail text, there is an HTML editor to help you upload pictures, format text, create bullet lists and tables, etc. This e-mail text is what the respondents will read before entering the survey. We recommend you to have a short introduction to the survey in this e-mail text. For example what the survey is about, why you are doing the survey and approximately how long it will take to complete the survey. Important: In order to have a working survey link in your e-mail you will need to have [[LINK]] somewhere inside the e-mail text. Should you remove the link from the mail text ([[LINK]]) you can easily retrieve it by clicking the “Survey Link” button in the upper right corner of the HTML toolbar. To insert the link: First select the area in the email text in which you want to insert it, click the button “Survey Link” and it will it be added to your email text. The option called “Include an opt-out link in e-mail” will add a text with and another link in the mail. When this link is clicked by the resondent, that person e-mail adress will be added to an account wide block list. This results in a block of any future mails to that specific e-mail adress. At the bottom of the page you will find the Scheduling of your sendout. Here you need to set a date and time when the mail will be sent. You can also create reminders. You can add several reminders in advance, if you wish. After clicking “Add reminder“, you will be given the option to timestamp this and also edit the mail text. You do this by clicking the “Edit Reminder“ button. You can also decide who should be eligible to receive a reminder by changing this from the “Send to“ drop-down menu. Please note: When in the Distribution overview, you will see your mail send out and all the reminders you set up. Clicking on Reminder will lead you to the original send out. The reminder is only visible and editable by clicking “Edit reminder mail“. Click “Continue” in the bottom right corner to save your e-mail and proceed to the “Respondents“ tab to add e-mail adresses to your sendout. In the respondents tab you will add all e-mail adresses that should receive your e-mail sendout. There are three different ways of adding recipients to the mailing. Add email addresses: This option allows you to easily copy and paste e-mail addresses from another source, such as Excel. The e-mail addresses need to be separated by a single line break. Use a previously uploaded list: Here you can select an already existing respondent list that have been saved to your account from Lists & Data. Add File: You can upload an Excel-file containing e-mail addresses that you want to send the survey to. In this list you can include information about your respondents. This information is also called “background data“. You can read more about how to design the file to successfully upload a file here. You will see how many email addresses you added to your sendout in the area called “Added“. If you already have added one or more email addresses to your mailing, you can manage these by clicking “Manage respondents“ (a small pen icon will appear right next to the number of respondents when there are respondents connected to your sendout). Here you can, for example, delete added email addresses from the mailing or edit information associated with email addresses. Click “Continue” in the bottom right corner to save your e-mail and proceed to the “Order“ tab to activate your sendout to the date and time chosen under “Scheduling“. In the Order tab you will activate all e-mail adresses that you have added to your sendout for sendout. The sendout will not be send until the date of your scheduling. If this date has already passed, the sendout should be sent within 5-10 minutes from when it is ordered. Before you order your sendout you can review the date of the mailing and reminders, as well as the number of recipients. When you click the “Order“-button, you will be asked if you want to activate the survey right away (unless the survey is already active). Before any e-mails can be sent, the survey needs to be activated otherwise your sendout will not be successful. 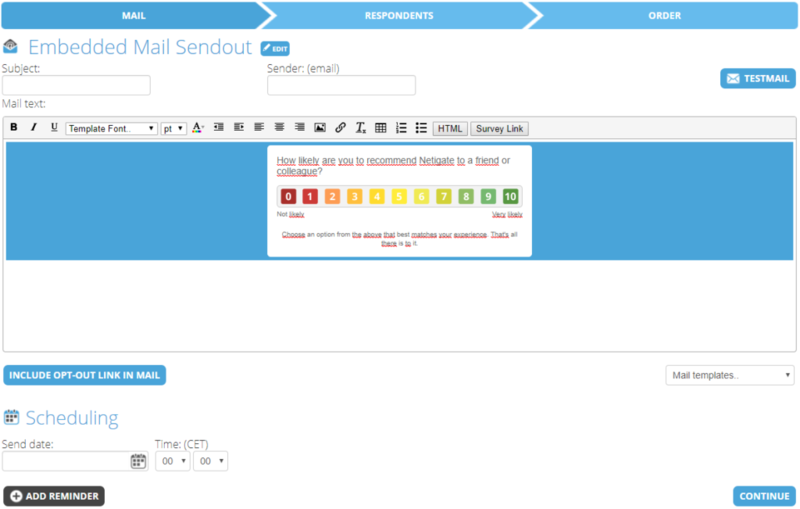 Once you have ordered the send out you will be forwarded back to “Distribution” and should be able to see a green dot, meaning that the sendout have been ordered, in front of the sendout name. Important: Should there be any warnings or information icons in your “Order” tab there might be some information missing or just something that you may want to double check. You can hover your mouse over these icons to see additional information. The red triangle means that there are information missing and your sendout can not be ordered as it is. The yellow triangle mean that there are something that you may want to double check, just to make sure you have not missed anything. When you convert an embedded question into a link survey you will get a pop-up window with the text “Generated HTML“. In this window there is a long string of code that you will need to copy and use it on your website, or the place that you wish to place it. It could be in a blog or an e-mail signature, just to mention a couple of suggestions.